ACROSS THE Horn of Africa evidence is mounting that relations with Gulf countries are growing stronger. Last month representatives from Djibouti, Sudan and Somalia gathered in Riyadh, the capital of Saudi Arabia, to discuss the creation of a new Red Sea security alliance. Three months earlier the prime ministers of Ethiopia and Eritrea signed a peace deal that Saudi Arabia helped to broker. In the Ethiopian capital, Addis Ababa, a property developer from the United Arab Emirates (UAE) is working on the largest and most expensive project of its kind in the city’s history. The UAE has had a military base in Eritrea since 2015 and is building another in Somaliland, a breakaway state in northern Somalia. Saudi Arabia plans to build one in Djibouti. And Qatar and Turkey are refurbishing a port in Sudan. Why? Like the Gulf, the Horn of Africa is predominantly Muslim, and the regions are also bound together by migration. Economic links were relatively dormant throughout the 1990s. But after food prices spiked in 2008, wealthy Gulf states rushed to buy farmland in Sudan and Ethiopia as a hedge against food insecurity. Between 2000 and 2017 Gulf states invested $13bn in the Horn of Africa, mainly in Sudan and Ethiopia, according to a study by the Clingendael Institute, a think-tank in the Netherlands. For resource-poor Horn countries the economic benefits of Gulf investments are obvious. Both Sudan and Ethiopia suffer from severe shortages of hard currency. 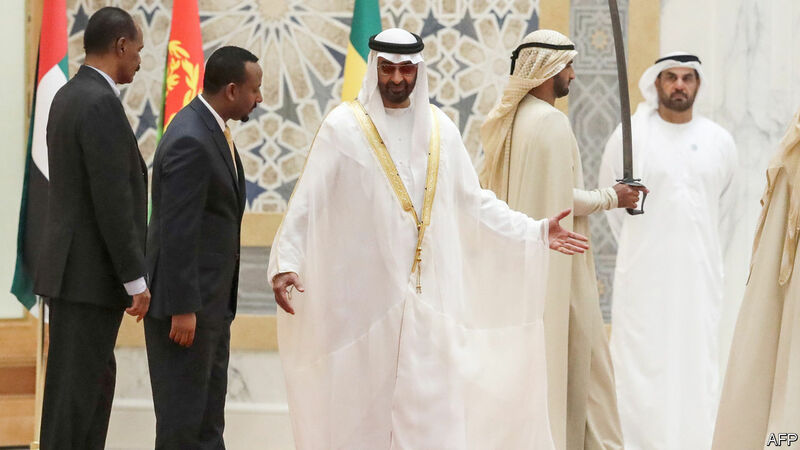 One of the first moves of Abiy Ahmed, Ethiopia’s prime minister, upon taking office in April was to secure $3bn in aid and investments from the UAE, including a $1bn deposit in the country’s central bank. Sudan’s central bank received a deposit of $1.4bn from the UAE in March. Read more Why are Gulf countries so interested in the Horn of Africa?